Landscape lighting offers an attractive an unobtrusive means of bringing safety, security and elegance to your residential property. 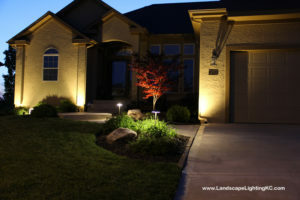 Since 2004, Landscape Lighting KC (a local division of Moonlight Decks LLC) has been providing high quality outdoor lighting installation in Kansas City and the surrounding areas, offering a broad variety of lighting options as well as friendly customer service at affordable prices. Interested in investing in landscape lighting for your property? Landscape Lighting KC is happy to provide free estimates to customers who are interested in landscape lighting installation. Give us a call at (913) 725-0965 to begin the process!